In 2004, a group of 80 individuals were discovered at Driffield Terrace, in York. They were buried between the late 1st and early 4th centuries AD, on a large cemetery on the outskirts of Eboracum, the Roman town of York.They are unusual because they are all believed to be male, most are adults – and more than half had been decapitated. When these 30 bodies were buried some got their heads in the right place – on their shoulders. Others saw their heads placed between their knees, on their chests or down by their feet. In one double burial the two bodies even had had their heads swapped over. Where these ‘headless Romans’ native Yorkshire-men or incomers, and might their origins be linked to the way they were buried? 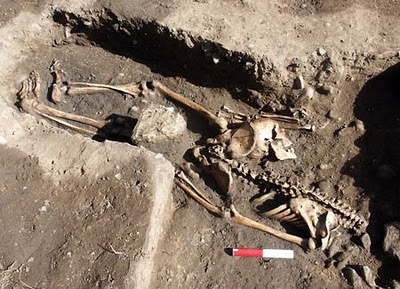 New research using isotope analysis has shown that the ‘Headless Romans’ found in a cemetery in York came from as far away as Eastern Europe. A group of archaeological scientists from the University of Reading and the NERC Isotope Geosciences Laboratory in Nottingham took samples of teeth and bone and analysed isotopes – atoms of the same element with different atomic weights – of strontium, oxygen, carbon and nitrogen. Scientists normally just look at strontium and oxygen isotopic systems to work out someone’s origins. But this time the archaeologists looked at the four isotopes together, combining information about the individual’s diet with the type of climate and geological setting they grew up in. At least two had a diet rich in plant – probably millet – that wasn’t grown in Britain at that time. If anything, it’s the diversity of their backgrounds rather than any common origin that was the defining feature for this group of burials. “This approach was very important in this case, because it has given us information about these unusual burials that would have been missed if only strontium and oxygen had been analysed,” said Dr Gundula Müldner of the University of Reading. Isotopes are absorbed by our teeth and bones from our food, drinking water and the air. Their proportions vary around the world due either to differences in regional geology or climate, so they provide important clues about where individuals grew up or spent most of their lives. Carbon (C) and nitrogen (N) isotopes are absorbed from our food and can be measured from dentine or bone collagen samples. They tell scientists about terrestrial and marine foods in an individual’s diet as well as the balance of plant and animal protein. They also distinguish plants that photosynthesis in different ways to produce different proportions of the isotopes C3 and C4. However, as most diets look similar, isotopically speaking, over large parts of temperate Europe, C and N isotopes are not usually thought particularly useful for understanding how people have moved around. From the 80 individuals discovered at Driffield Terrace, 18 were tested for oxygen and strontium. The strontium analysis showed that 11 of them grew up on food that wasn’t grown locally. Two oxygen results were well outside the estimated range for Britain – one of the persons spent his childhood in a cooler climate and the other in a warmer one. Where possible the team tested four isotopes in the same individual. In combination, the oxygen and strontium isotopes indicated that just five of the men tested grew up in York. The others either came from elsewhere in the north of England, or as far as France, Germany or central southern Europe or the Mediterranean. In total 68 individuals were tested for carbon and nitrogen. Five of them were markedly different from local populations. Two in particular had eaten diets with distinctly high carbon isotope ratios, indicating the consumption of C4 plants – or the products of animals raised on them. The only ‘C4 plant’ cultivated in Europe at the time was millet, but it was almost certainly not grown in Britain during this period, possibly because the climate was too wet. To have eaten enough of their distinctive diets to produce these unusual isotope results, the scientists conclude, these two individuals must have come from abroad. Crucially, a number of the individuals identified as incomers from the carbon and nitrogen results would not have been picked though strontium and oxygen analysis alone. Compared to what is known so far from cemeteries across York, the ‘Headless Romans’ do seem to have much more exotic origins than groups with less unusual burial rites. But the study didn’t find any consistent link between their geographical origins and whether they were decapitated. Gladiators, Soldiers, Executed or Religious Fanatics? There are many theories about ‘the identity’ of the headless Romans – and their decapitators. In 2006, isotope analysis suggested that three of the men were from Northern Europe (including Britain), one from the Alps, one from the Mediterranean, and the final one from north Africa. The 80 could have been soldiers or even – according to the 2006 Timewatch special ‘The Mystery of the Headless Romans’ – men from Emperor Severus’ household, executed by Caracalla. June this year, it was announced York’s headless Romans might have been Gladiators – the subject of the Channel 4 documentary ‘Gladiators: Back from the Dead’. Evidence cited for Driffield Terrace being the ‘worlds only well-preserved gladiator cemetery’, is the discovery of a ‘large, carnivore bite mark’ and a high incidence of substantial arm asymmetry. Further, some healed and unhealed weapon injuries and possible hammer blows to the head (a feature attested as a probable gladiatorial coup de grâce at another gladiator cemetery at Ephesus in Turkey). Surely, the 30 decapitated individuals died a violent death, but they could also have been criminals – one of the skeletons was found with heavy lead leg-shackles, or even members of a religious cult. The research is part of the Arts and Humanities Research Council(AHRC) funded project ‘A Long Way From Home: Diaspora Communities in Roman Britain’, which earlier identified the ‘Upper Class’ (and early-christian) Ivory Bangle Lady buried at York as African. The research by Dr Gundula Müldner, Chenery and Dr Hella Eckardt is published as The ‘Headless Romans’: multi-isotope investigations of an unusual burial ground from Roman Britain in the Journal of Archaeological Science (2010).